Catalonia is one of the most interesting and beautiful areas in Europe, It has always been famous for its fabulous beaches, mountains, rich culture and world class golf courses. It had been a life time ago when I first visited the region with some good friends. We bought an old land-rover, painted it blue and went on an adventure of a life time. 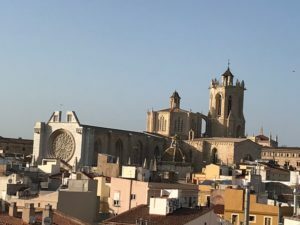 Our journey took us through the UK, through France, the Pyrenees into Catalonia were we spent a long and wonderful Summer. When I was invited to Catalonia earlier this year on a golf and wine pairing trip without hesitation I replied, yes please! I couldn’t wait to see this beautiful place again. 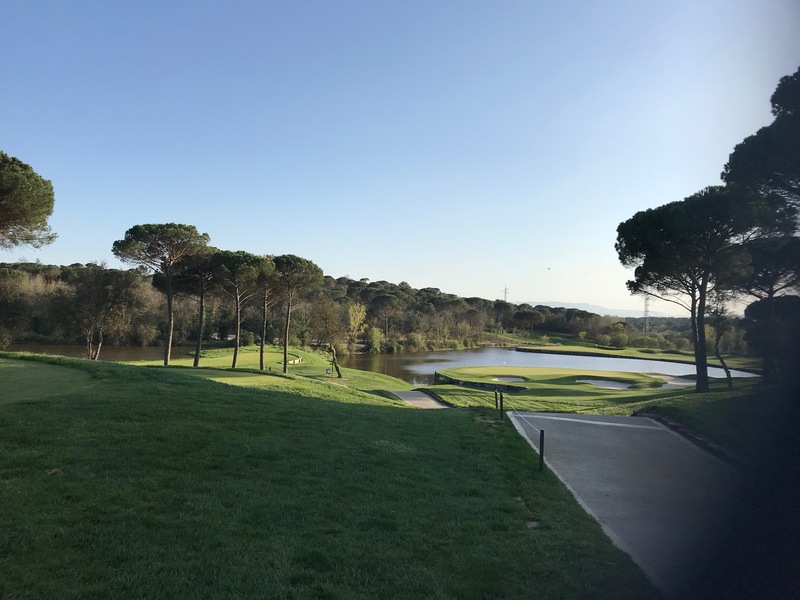 The first part of the golf and wine pairing tour was to the Evenia Rossello, a 4 star hotel located in the heart of the business district of the Catalan Capital Barcelona. The location is ideal for sightseeing as it is within walking distance of the Passeig de Gràcia and Plaza Catalunya which is famous for its modernistic architecture, designer shops, restaurants and art galleries. 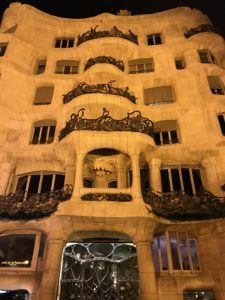 After checking in and abandoning the golf bag with the very friendly and welcoming reception staff, there was just enough time for a quick change before going to dinner at La Vinoteca Torres restaurant and wine bar on the Passeig de Gràcia. 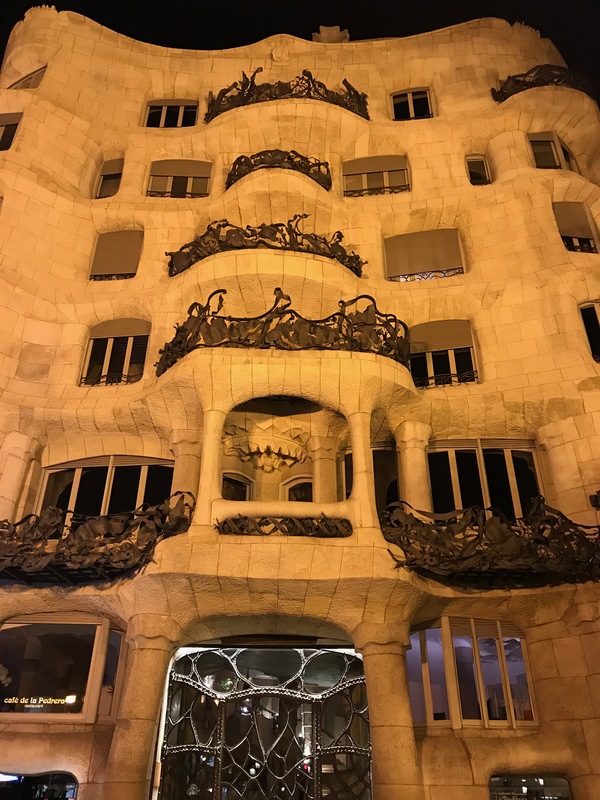 Within minutes from leaving the hotel we were strolling along the famous boulevard passing busy restaurants and some of Barcelona’s magnificent buildings, including Gaudi’s master piece La Predera. As we were only going to be in the city for one night there was obviously not enough time to see and experience everything but enough to make you want to return. On arrival at La Vinoteca we were ushered directly to our table, thankfully we had a reservation as every table appeared to have been taken. I wish could share the aromas and the delight and inquisitive looks on the faces of diners as their artistically presented plates arrived. Adding to the wonderful atmosphere a guitarist was softly playing beautiful Flamenco pieces. The food served was amazing, a superb selection of Torres wines expertly paired with sensational dishes prepared by Chef Mercés. 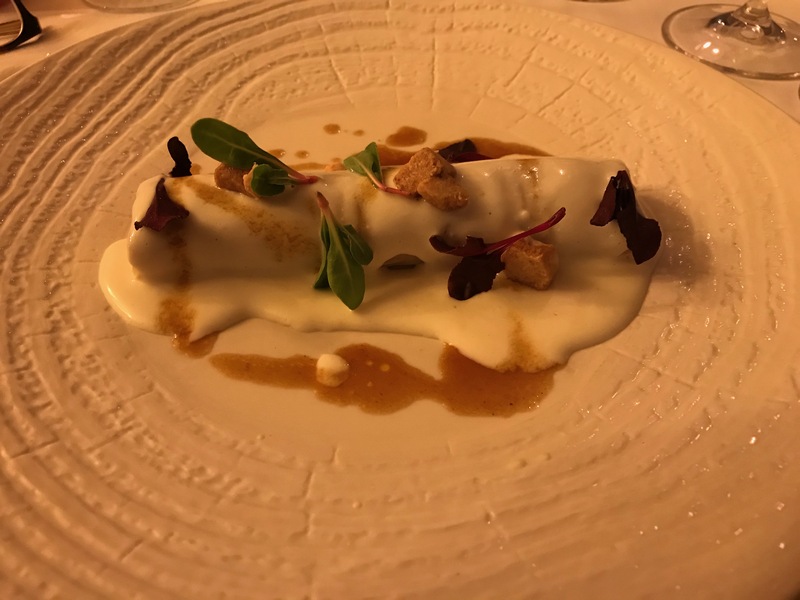 Traditional Catalan and Mediterranean dishes, from delicious Iberian ham croquettes, cannelloni with truffle oil, Octopus, to fillet minion with tarragon sauce. Two of my favourite wines from the evenings tasting were a 2015 of Sons de Prades from Vineyard de Miranda and a 2014 bottle of Purgatori. Great label, superb wine, worth the penance! Just thirty minutes from capital is the exclusive Real Club de Golf El Prat. 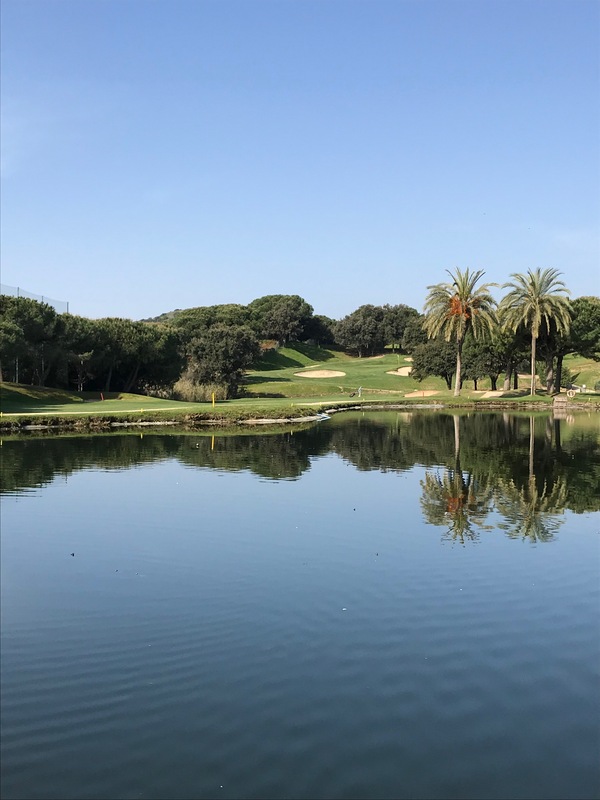 Regarded by many as one of the finest golf clubs in Spain, it’s one of the few clubs with the Real or Royal title which was granted by King Alonzo X11 after his visit. The club was originally named Barcelona Golf Club but was moved to El Prat de Llobregat in 1954. Due to the expansion of Barcelona airport in the late nineties the Real club changed its location to the picturesque BonVilar country estate, near Sant Llorenc del munt il’Obac and Collserola Nature Parks. El Prat has hosted more than 250 national and International championships, including The Spanish Open on ten occasions and has just recently been named as one of the 125 Platinum Clubs of the World-Five Star Private Club, as well as being granted the Golden Plaque of the Royal Order of Sporting Merit. The magnificent forty-five holes created by Greg Norman is made up of five loops, the Open, the Blue, the Yellow, Pink and Green each course can be played in a variety of combinations. The courses are all of Championship standard but equally offer a challenging round for the amateur. Check out the website and decide the combination you would like to play, which ever your are guaranteed an unforgettable experience. El Prat’s magnificent clubhouse was designed by the award winning architect Carlos Ferrater. The restaurant and locker rooms are fabulous, practice facilities feature a 300 metre driving range and top class practice area for the short game. The club offers excellent packages for visitors, green fees mid week are around 112 euro. The location is perfect for experiencing the region and the vibrant Catalan capital. Although this is an up market members club visitors are warmly welcomed by everyone at Real El Prat. Forty-five minutes north of Barcelona in the Girona Mountains is the exclusive PGA Catalunya Resort. The complex consists of two superb courses, the Stadium and the Tour, a five star hotel and the newly opened ultra modern Hotel Lavida. 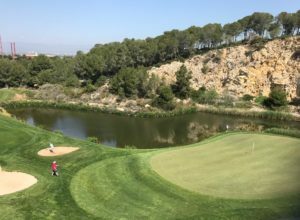 The Stadium course was designed by Neil Coles and Angel Gallardo, soon after the course opened it hosted The Gene Sarazen World Open in 1999 and and Spanish Open in 2000. Since then both courses have hosted a number major events and have received many International awards. 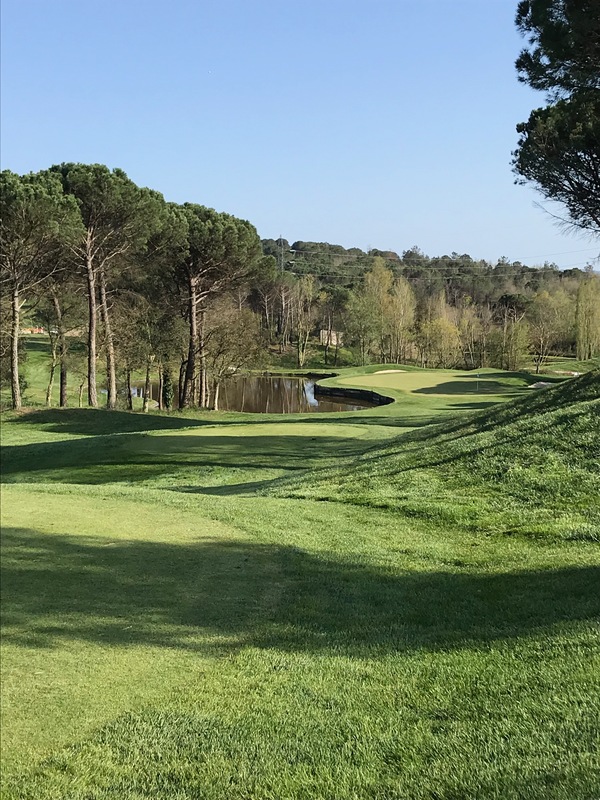 A stunning course with sweeping fairways that meander around tall fir and pines and strategically placed bunkers and water hazards to catch you out. There are many memorable holes on this course and what ever experience you’ve had on the day, you’ll want to return and play again and again. Hotel Lavida ideally suited to the modern day traveller and perfect for golfing groups. The minimalistic designed rooms are kitted out to the highest standard, wi-fi, walk in showers, big comfortable beds with lots of space for storing your clubs. 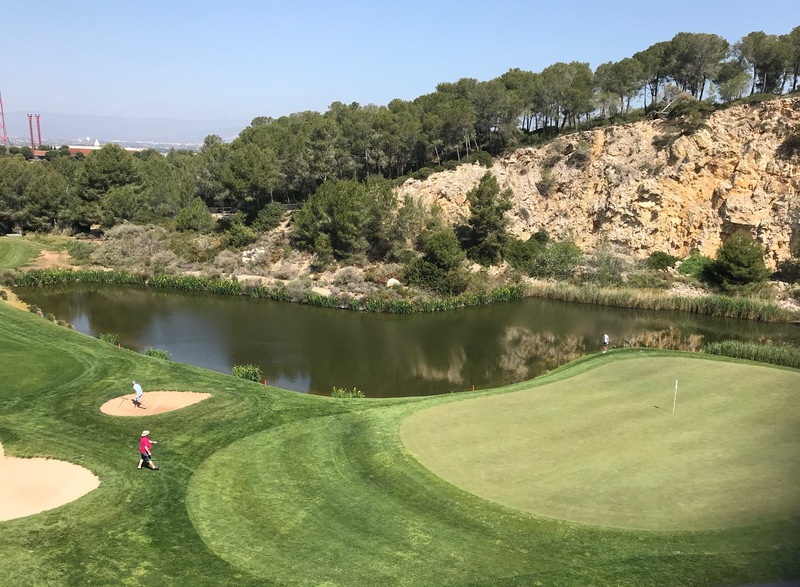 There is a great atmosphere around the complex especially in the bars and restaurants after play when golfing post-mortems take place over a few glasses of Catalonia’s best beer or wine. After playing the Stadium we dined at the resort’s wonderful five star Camiral hotel, I can honestly say the food and wine was to die for, a complete Catalonian gastronomic experience from start to finish. The service was amazing, everything one would expect from a five star establishment. The next morning we were off early to Club de Golf Llavaneras. Spectacular sea views, warm breezes greet you on arriving at this wonderful Mediterranean estate. The course designed by F.W. Hawtree was originally a nine hole, it opened in1945 and was later extended to 18 holes when further land became available. Caps off to Spanish designers Ramoan Espinosa, Magi Sarda and Alfonso Vidaor who created the gem it now is. 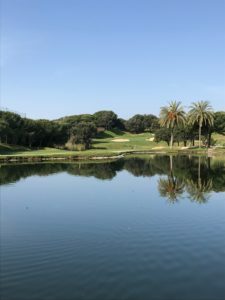 A fabulous golf course set in a luscious natural landscape that feature magnificent trees, flora and stunning sea views. 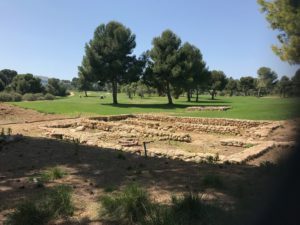 Llavaneras is shorter than most 18 hole courses but don’t think it is a walk in the park as it does what its meant to do, challenge as well as entertain. The excellent facilities include a bar and restaurant that serves great food. Staff are warm and friendly. Its location half way between Girona and Barcelona make it ideal for a golf and city break. Last but not least is Lumine Golf Resort which is situated close to the town of Tarragona on the Costa Daurada. The resort features two fantastic18 hole championship courses the Lakes, the Hills and a 9 hole named the Ruins course. The Lakes and Ruins courses are both designed by Greg Norman and The Hills by Alfonso Sarda. Vidaor and Magi. The Hills is an interesting and testing course that runs through a beautiful forest of Pine, Carob and Olive trees, with stunning views to the Mediterranean. The Lakes course winds round the Sequia Wetlands area, it is probably the most technically challenging of the three courses. As you can guess by the name there are a lot of water hazards. The 9 hole Ruins course can be played as 9 or can be combined with 9 from one of the other courses. The unique course is fairly flat and built amid the Roman remains of archeological sites dating back from the second century B.C. My favourite was the Hills, it was both a challenging and enjoyable experience. The fabulous clubhouse over looks the18th green, a tricky but fun finishing hole. Add to the “must play” list, you won’t be disappointed! Catalonia is home to some of the best restaurants in Europe and some of the best wineries. 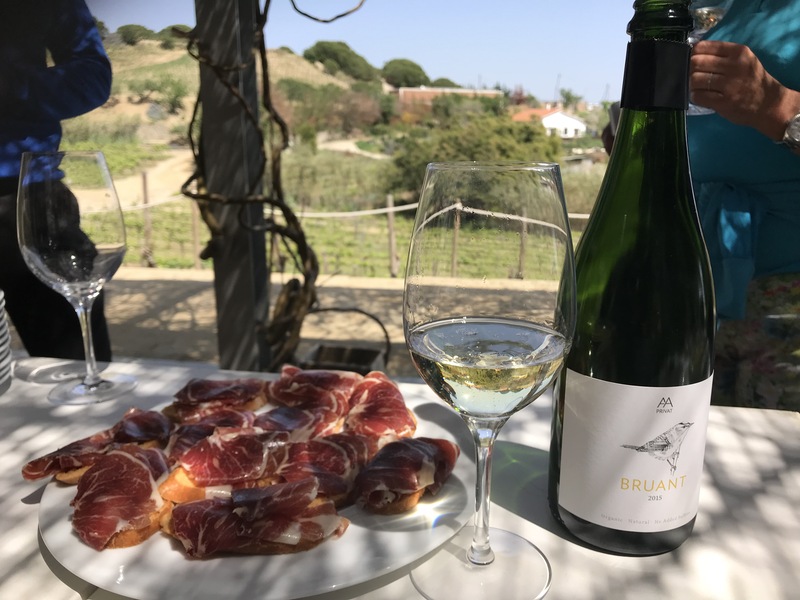 One of the highlights of our tour was a visit to Alta Alella a family-run organic winery situated high in the Serralada de Marina Natural Park just 20 minutes from Barcelona. We learned a lot about the process of wine making at this unique winery. One of the most important elements in growing in this area is the Saulo soil which is an acidic and sandy soil with low limestone content. Alella’s particular micro-climate of mild winters and warm summers also determine flavours. Varieties of vines planted on slopes facing south are destined for sweet and red wines, while slopes facing north give aromatic and floral wines that are ideal for Cavas and white wines. After a very informative and fascinating afternoon hearing about Alta Alella it was time to taste. Alella’s magnificent new visitor is situated in the centre of the estate over looking acres of vines and the Mediterranean Sea. In a perfect setting a variety of delicious tapas were served up with some of the best Alella wines. 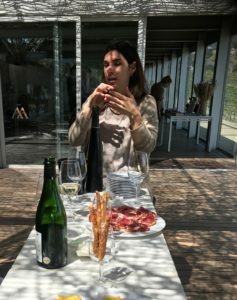 As a red wine drinker I am always anxious to get to what I think I will like, but after shortly tasting a few of the white wines I was completely won over. Some of my favourites included a 2016 Chardonnay from the Parvus range, it was fresh, mildly fruity, not too acidic and wonderfully creamy. I loved the Orbus [Crianza] 2015, my kind of wine, it was bursting with flavour, spicy notes with some bite. Fabulous! I have never been a fan of sparkling wine but after tasting some Alella’s excellent bubbles I had to buy a few bottles to bring back to my Cava loving friends in Ireland. Well I confess did keep one! 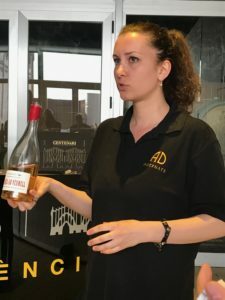 Another of Catalonia’s superb wineries is Adernats Vinicola de Nulles. This vineyard has a very unique and interesting history. The phylloxera plague wiped out Catalonia’s heritage vineyards in the 19th century. In 1900 the inhabitants of Nulles got together and created a co-operative. Catalonian architect Cesar Martinelli who was a discipel of Gaudi was engaged to design and build Nulles Wine Cathedral. A tour of Nulles is a must not just to taste the exceptional wines produced but worth visiting this magnificent architectural work of art. You can choose a guided history and wine tasting tour or a night time ViNiCulture visit with sensory dinner. Today the winery exports 200,00 bottles of Cava and 100 bottles of wine world wide under the name of Adernats. I think you can call that one great success story. 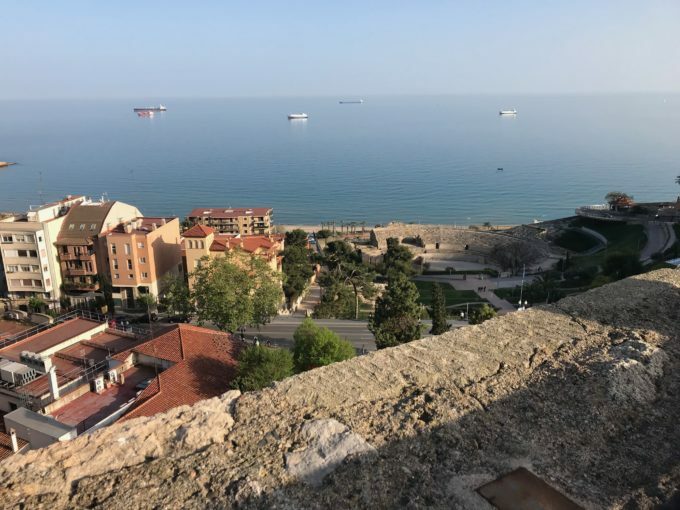 Located on the Costa Dorada 60 miles south of Barcelona is the city of Tarragona. The city has a fascinating history and it is worth taking one of the guided tours. Places of historic interest are the Roman Amphitheatre, the 12th Century Cathedral and the Archaeological Museum which overlooks the sea. The beaches have lots water sport activities including Spain’s largest theme park, Port Adventura. Hotel Monica, is located on the seafront in Cabrils, just 100 metres from the beach and within walking distance of the town centre. My gorgeous room with its big comfortable bed was so welcoming after a full day of sightseeing, wine pairing and a round of golf. This would be a fabulous place to spend a relaxing week, there is a huge garden area, a swimming pool with sun loungers which feature beautiful palm trees. In the summer evenings the hotel garden is transformed into a Haima [ a Bedouin tent ] a very relaxing place to chill out listen to music place and enjoy a few drinks. 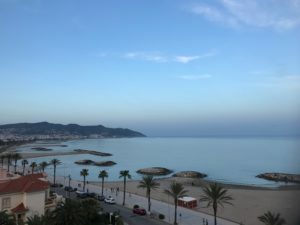 There is no shortage of great seafood restaurants and authentic tapas bars along this coast, we dined at a fabulous little restaurant on the sea front in Cabrils. Restaurant Miguel de Cambrils. On the menu was local speciality Arrs Negre, a rice dish boiled in cuttlefish ink and Rossejat, a noodle dish made with fish broth washed down with some great Catalonian wine, YUM! 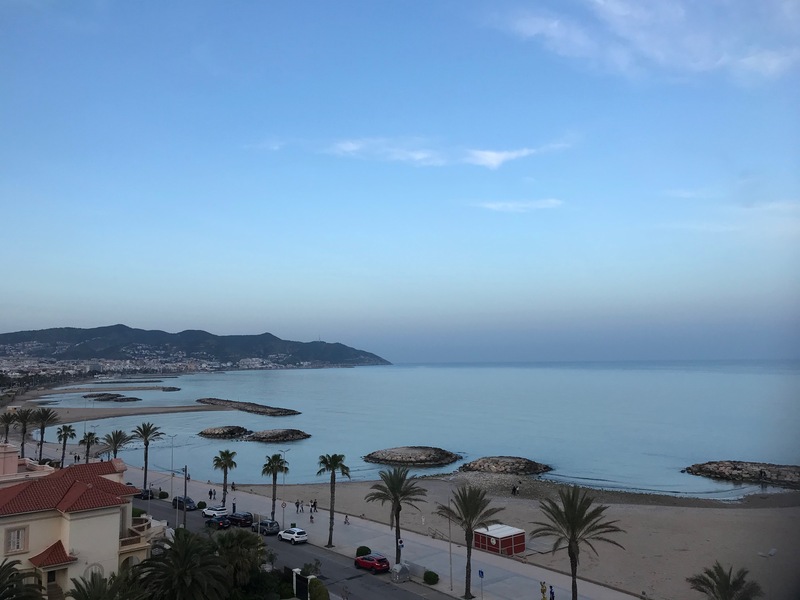 Our final night we stayed at the Melia Terramar in the lovely coastal town of Sitges. The Terramar is located right beside the beautiful beach close to restaurants and bars. The minimalist designed rooms are spacious and airy, with up to date technology, most rooms have terraces with stunning sea views. The luxury hotel has two restaurants one with a large terrace that overlooks the sea. There is an outdoor pool and a spa that offers signature massages, yoga classes and relaxation therapy. Nearby is Club de Golf Terramar, the club also has a good tennis course. Perfect hotel and place for a relaxing week in the sun with friends or family. Finally it was time to go, the five days had gone in a flash, there was so much more to see and do, more golf courses to play. I feel I must go back soon, I may even look for that little house opposite the beach where we spent a Summer all those years ago. Catalonia is still as beautiful, unspoiled and its people still as warm and friendly.